Saturday 29 May saw the return of the MX-5 Owners Club to the famous Ace Cafe, London. This looks set now to become an annual event for the Club and Project Merlot and friends would not want to miss this. Its a great excuse to have a proper fry up and lots of proper mugs of tea! No Owners Club rally would be complete with out an appearance from Project Merlot but rather than being dismantled by Robbie Marsh as part of a technical demo this time the Merlot took on plenty of much shinier metal in the modified car competition class. No prizes this time but we like to think that unlike much of the competition the Merlot track pedigree proves its all go and not just all show. 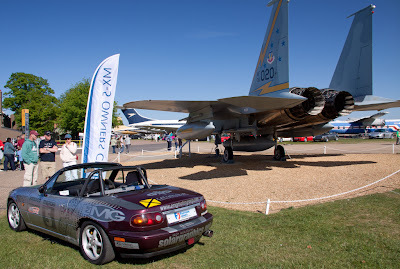 The MX-5 Owners Club Eastern Region where on show at the annual Spring Car Show at the Imperial War Museum, Duxford. The Merlot took pride of place on the stand alongside another slightly faster exhibit!